You may have been thinking about some covered patio ideas to give your patio a little more shade and protection. There are so many different choices for covering patios that all you need to do is figure out what fits in your budget and what your primary reason for wanting a patio cover is. Maybe you just want a shady spot to exercise outdoors in the summer. Perhaps you want an area outdoors you can use year round for projects that can't be done indoors. You may have a patio that is in full sun all day long. While that can be enjoyable on a warm spring day, in the heat of summer it feels more like you can fry the proverbial egg on the sidewalk. Putting up a patio cover will make the difference between your patio being a place to get sunstroke or a place to relax during the summer. Maybe you want to be able to use your patio in all kinds of weather. In that case you may be looking for a more solid cover that will withstand sun, rain, wind and possibly snow. You'll be looking at a structure that is a permanent addition to your home. You'll also need to think about if you want to add lighting or a ceiling fan into this design to make the patio more usable. Next you need to figure out what kind of a budget you have to spend. Once you've answered these two questions, you are ready to begin searching for patio covering ideas. Probably the least expensive way to provide shade to your patio is to put up a large sun umbrella. Umbrellas come in a variety of colors and styles so you can find one that fits your décor and will offer you a little respite from the sun. Some come with a push-button ability to tilt as the sun moves. Another method of providing shade that is more affordable is to cover the top of your patio with lattice. 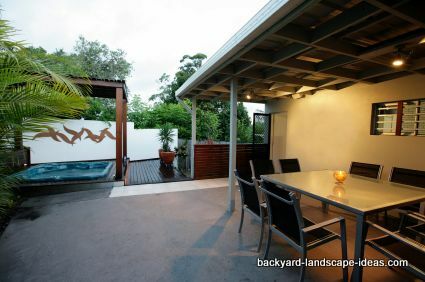 As patio covering ideas go, this one is very attractive. By installing support beams and framing for the roof, lattice or slats can be attached across the top that will provide a semi-shaded area below. Vines like wisteria, clematis, trumpet vine, roses, grapes and other climbers can be encouraged to grow and eventually cover the top, giving you a beautiful, verdant bower under which to relax during the heat of summer. but they can be attached to your house as well. During fine weather, just unfurl the awning for instant shade. When you don't need it, just retract it back up to its normal position. The real advantage to an awning is you get to enjoy your patio both covered and uncovered. If you want a covered patio to use no matter if the sun is shining, the clouds are pouring rain or you're in the middle of a snow storm, you want something more permanent and solid. You will need to check the building codes in your area to check for snow load or wind speeds that need to be accommodated. While more expensive than a shade-only patio covering, a solid covering can give you a lot of advantages, too. You can have lighting or a ceiling fan wired into the ceiling of your patio covering, allowing you to enjoy your patio at night and to circulate the air on hot days. There are many materials to choose from when building a permanent cover. You'll find patio coverings made of alumawood, wood or metal. And don't think you must make a plain cover. Patio covers can be ornate, decorative and add to the value of your home. With a permanent cover, you can move your more tender plants to a protected spot under the cover when the sun is fierce or the temperatures drop. You can also have vines grow up the support columns to soften the look. Decision time! No matter which kind of patio covering fits your needs, you'll be happy you added it when you use your patio.